BigDog does not react, its mute body and spinning cyclopean eye simply taking in the world as raw emotionless data. 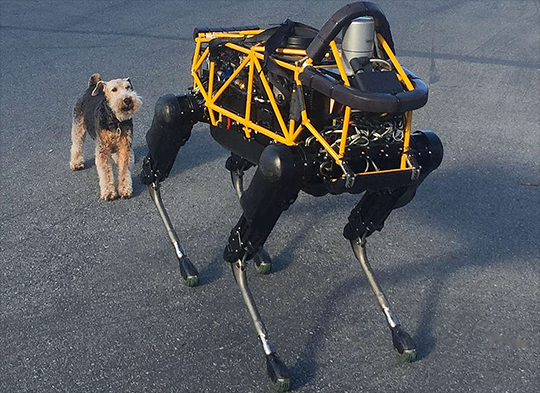 BigDog’s human operator happily steers the contraption away from its would-be assailant. This is hardly the first time animals have reacted poorly to trespassing machines. The internet is full of videographic evidence of animal-on-robot violence, and some animals now are specifically trained to attack unmanned aerial intruders. A study in bears found that, while they appeared outwardly calm when pestered by drones, their heart rates and stress levels spiked. It is no surprise, then, that a real dog would hate a robot dog. And if the Terminator universe is any guideline for the future (it isn’t), this canine reaction to K9s will save lives.